The Athens anti-racism festival is happening right now and it’s being held in Goudi park, right across the street from where we live. Some of you may already know I’m involved in campaigning against commercial developments in Goudi Park and as such we were offered a booth and projection screen at the festival. First off, I was amazed at how many booths there were. It’s unbelievable how many people have a cause they’re passionate about. There must have been hundreds of booths. So many causes. Image by brettwayn via FlickrOne booth I’d like to mention is the OLPC (One Laptop Per Child) booth. For those who don’t know about the OLPC, in a nutshell, Nicholas Negroponte founded and leads a group of people that design and produce a cheap to make laptop. While chatting to the guys there, I was struck by what I was told. This very noble project is in real danger, it’s being hijacked by commercial interests that support the Windows/Intel platform. 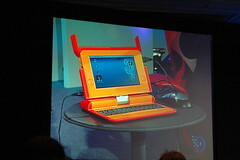 Clearly, giving billions of poor kids a linux based PC is a real threat to Wintel so wintel is deliberately sabotaging development of distributed production and distribution of the OLPC.